You could call Girls groundbreaking artistic work. You could also say it’s Internet trolling elevated to an art form. 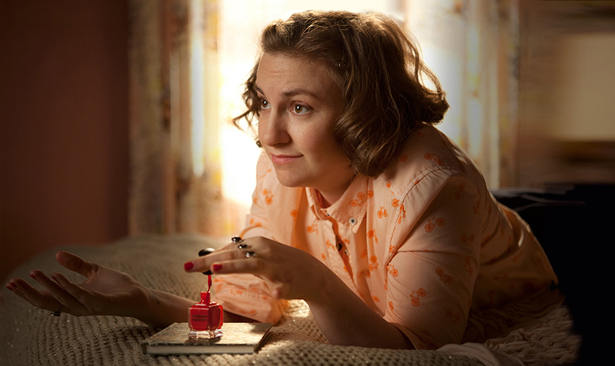 Lena Dunham as Hannah Horvath in HBO’s Girls. I’ve written about Lena Dunham in this space before, and I’m not looking to repeat myself, but the gist of my take on Girls is: it’s fine. Just that. Not the Second Coming of twentysomethings (which one shudders to contemplate anyway), nor some brave new art form. Girls has some good jokes embedded in unremarkable-to-sloppy plotlines and acting, but otherwise I generally prefer control and artfulness to Apatowian craft-of-no-craft. That said, I watch it faithfully for the occasional flashes of talent it contains. So there was no reason for the queasy feeling I got when I heard that the show had been renewed for a third season. I mean to say that I actually felt a pit of dread begin to open in my stomach. I interrogated this overreaction, and concluded: my objection is not so much to the show as it is to the endless amounts of thinkpieces—as I once saw someone put it, Very Important Essays—Girls inspires. There are thinkpieces about thinkpieces and now I suppose you could call this a thinkpiece about the general phenomenon of Internet thinkpieces about television shows, so yes, on some level, I’m a hypocrite to point that all that out. To be fair, it is usually less profitable for the individual who does the confessing than it has been for Dunham. As usual, Dunham’s view of the economic situation of her characters is seen through the rose-colored glasses of someone who entered the market well-connected. Two hundred dollars is actually pretty high for a confessional essay. xoJane, which the show seemed to have used as a model for its fictional website, reportedly pays about $50. But she is showing that the formula can work if you are simply deft at manipulating it. As of this writing, Girls ratings continue to hover around 1.6 million watchers. And in fact, though few seemed willing to write about it, ratings were slightly down for the second season premiere, and that’s even as New York magazine celebrity profiles refer to Dunham as “leading the culture.” Which I suppose she is, if by “culture” you mean “web commentary." To point out that media hype does not quality make is practically commonplace. But to an extent, we always presumed that was because media hype existed in some kind of elitist bubble, the people with the typewriters in the mainstream press wielding extraordinary power and having consequently blinkered views. But even as it has inarguably widened the circle of people who can speak and be heard, the Internet has not much changed that dynamic. Like some kind of crowdsourced tabloid, online culture alternates between rage and adulation, with no room in between. Sure, Girls pushes some cultural buttons that are tangled up with ideas about what women are and should be. But its engagement with those issues reflects a very particular kind of relationship that exists between artists and the people—journalists, bloggers and, yes, comments sections—they spend way too much time reading and thinking about on the Internet. My friend Maura Johnston, a music critic late of The Village Voice, has a word for that dynamic: trollgaze. She describes trollgaze items as “those pieces of pop culture as designed for maximum Internet attention as they are pieces of art that can stand (or at least wobble) on their own.” Principally the mechanism trollgaze uses is annoyance, which sets off a boom-and-bust critical cycle. Dunham seems to know this. When quizzed about objections to her apparently transgressive body (transgressive by Hollywood standards, that is) that come largely from the kind of troglodyte who lives in YouTube comments sections, she said: “Get used to it. I’m going to live until 105 and I’m going to show my thighs every day.” That, for better or for worse, is the definition of trolling: doing what you know will annoy people, even if your cause is a just one. And yet if you don’t watch it, the commentary can ultimately overwhelm the product. Which, in my personal opinion, is already what’s happened to Girls. Dunham recently gave her character a black Republican boyfriend. There are quibbles about whether she cast him before last spring’s avalanche of criticism about the show’s frankly lily-white worldview. But ignore the meta-commentary and watch the show, and his insertion seems purposeless. He is given few lines, no character development to speak of and comes off as a non sequitur. He’s there to get off a few jokes about how Hannah is clueless about race. Then just two episodes later he’s gone, because the Internet’s recappers and bloggers have launched their thousand ships about how his existence in the show is or isn’t racist and need her to give them some new material. Which, whatever else you might think of the show, Girls has a near-unparalleled success rate on. For more on Girls’s cachet, read Nona Willis Aronowitz’s take on Girls and Shameless.